Recently released income data from the 2016 census show that Saskatchewan had the strongest wage growth in Canada in the decade between 2005 and 2015. Statistics show that the median income in Saskatchewan increased by 36.5 per cent. 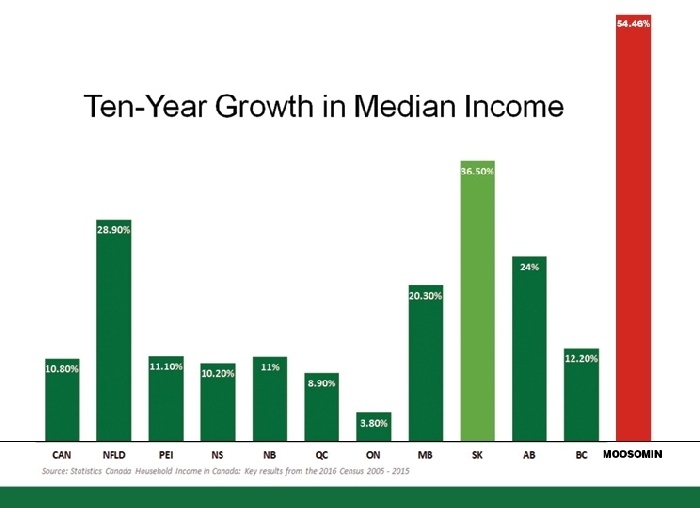 “Thanks to you Saskatchewan, median, or typical, incomes have grown faster here than in any other province in Canada during a decade of growth,” Premier Brad Wall said in announcing the provincial statistics. Income growth in the town of Moosomin has been even more impressive than the provincial growth rate. Median income in Moosomin increased by 54.46 per cent between 2005 and 2015, according to census figures—about five times the national rate. Most communities in the area also had median income increases at or above the provincial average. Saskatchewan Minister of the Economy and Moosomin MLA Steven Bonk said he was happy to see that the Moosomin area is doing well in terms of earnings growth. What does he believe has made the difference for the province coming out on top in terms of income growth? “Just being open for business,” he says. “Our government has made the conscious decision to be open and friendly to private business. “We have a competitive tax structure, for one thing, we limit the amount of interventionist policies, especially when you’re influencing the private markets. We try to create legislation that’s necessary but limited, and then get out of the way. Let private industries do what they do best. That’s what our government has done, and you can see it in the results. Our economy is flourishing. “We try to create an open and inviting environment for investment and business attraction. We try to keep taxes low, we try to be business friendly, we try to attract as much foreign capital to our markets as possible, and you can see what has happened. What does the government need to do to continue the success? What is the most important component to that? Mayor Larry Tomlinson said he believes the proximity of PotashCorp Rocanville impacts salaries and wages in the community. “We have the mine jobs, local businesses have to be competitive with the mine for employment, and we are becoming hub for the area with a lot of professional people in town,” he said. “We are drawing in more doctors and dentists and other professionals, and we’ve got some pretty successful businesses in town and they’re paying good wages to keep good people. What does Tomlinson think sets Moosomin apart?